Thousands of Reggae music fans poured into Irish and Chin's highly anticipated New York event "Reeewind" over the weekend. Patrons hailed from far and wide, some stating that they traveled from as far as Atlanta and Miami, to take in the landmark staging. And in return -- all in attendance received several solid hours of "Rub-a-dub" entertainment provided by the one-and-only King Stur Gav, Mighty Crown, Brigadier Jerry, General Trees, Capleton, Beenie Man, Sugar Minott and Santa Ranks. Not even monsoon rain could dampen the vibes or attendance of "Reeewind." With strong promotions by Irish and Chin and endorsement by New York's IrieJam radio, the flashback "Reeewind" was a success. Three of the artists originally billed for "Reeewind" faced immigration issues. Namely, U-Roy, Luciano and Charlie Chaplin were unable to perform. Never-the-less, Irish and Chin came up with a quick solution. While it was impossible to replace all three of the artists, the promoters identified a suitor. Not only did Sugar Minott willingly fill in -- he mashed up the place with flawless vocals through out the night. Irish and Chin is grateful that fans stuck in there despite last minute changes. "Reeewind" jump started with an intense early warm by the "Far East Rulers" Mighty Crown. For over three hours, Mighty Crown laced Amazura with straight "Rub-a-dub" classics. The crowd responded well as many in the audience held their partners close to groove to the timeless hits. Mighty Crown boldly displayed a side not often seen by the massive. Sami, Simon and Koji, Mighty Crown's foundation guru, maintained great continuity and control of the crowd until 1:30 AM. Following Mighty Crown was the one-and-only King Stur Gav. The caliber of music that King Stur Gav unleashed was impeccable. Once the bass line dropped, artists took center stage and gave patrons their money's worth until the wee hours of the morning. Amazura was officially converted into a sweat-soaked, vibes-filled "Rub-a-dub" session. In a fashion reminiscent of Reggae music's phenomenal era, the artists toasted on the mic, delivering explosive lyrics over foundation riddims. With Amazura filled to capacity and crazy nostalgic vibes overcoming the audience, most did not budge an inch for the entire night -- not even for a bathroom break. Every artist on the ticket was a hot item. The audience roared many times through out the night, whether it was for recognizable lyrics or quick-fire freestyles. 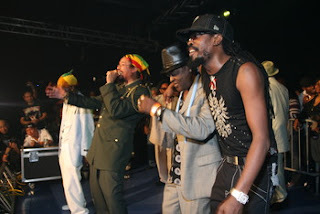 Born for the stage, Beenie Man dominated the mic for quite a while until he was slightly schooled by Brigadier Jerry who later commanded the audience with his relentless microphone skills. Often credited as one of the forefathers of dancehall music, Brigadier Jerry proved that he is the ultimate deejay. General Trees held his own rather impressively. He entertained the fans through out the night with his ability to ride riddims continuously. Meanwhile, Santa Ranks held it down for New York. Although Capleton's stints on the microphone were brief, the crowd went wild each time he touched the stage. Capleton relied partly on his heavy catalogue of music, while on the mic. Never-the-less, the audience respected his presence. Sugar Minott laced the "Rub-a-dub" riddims with perfection. His full fledged vocals were the event's main ingredient. From belting freestyle lyrics and those of his own hits to top Reggae and R&B selections, Sugar Minott was a force to be reckoned with. At 4:00 AM, patrons were still trying to get in the sold-out event. Even when the lights came on shortly after 4:30 AM, the audience was still enthralled. Finally, Amazura emptied out and based on the exiting chatter, people were rather pleased with "Reeewind." Irish and Chin was thrilled that people had a good time, without worries. This event exposed Irish and Chin to a wider audience, as most present did not resemble typical Irish and Chin supporters.